When this message came in, I laughed out loud. First, because I recognized the about picture right away. And second because I as I thought back over the morning, I was doing it. It? “It” today is the grousing and anxiety. Most of us yesterday probably grateful relaxed, enjoyed great food, had a great time with family and friends etc. Then boom. It is today, (or maybe even last night) and we are off in the running. The holiday season has started. We’ve started new lists with new time tables. We’re now worried about the clock and calendar. And….we start getting grumpy and anxious. We forget the reason for the season. We forget we are grateful. 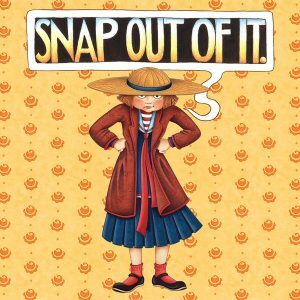 Thus, today’s message tells us to “snap out of it.” We have that power. We just have to recognize when we are in the funk and change it. -Remember your HOPE, joy and blessings. You are loved. -I love having Alex and James home. -Alex was so much help yesterday morning. Everything went soooo smooth. -Will literally cooked the best turkey I have every tasted. Perfect for the rest of the wonderful dinner. Lots of fun with the family and friends. -Going to the movies with the Liederbachs. Very fun.